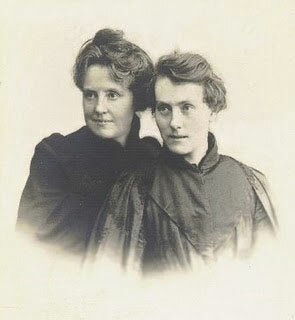 Katherine Harris Bradley (1846-1914) and Edith Emma Cooper (1862–1913) were British poets; together they used the pseudonym Michael Field, and wrote around 40 works under this name. Cooper was Bradley’s niece and ward. They lived together, as atheists and lesbian lovers, in what they called a ‘female marriage’, from the time when Cooper was a child. They claimed they worked together so closely that they could not tell who had written which line in their work. In their poem ‘It was deep April’ they wrote: ‘My love and I took hands and swore / Against the world, to be / Poets and lovers evermore’. When Cooper turned 16 she attended classes at the University of Bristol, Bradley came to classes with her. Their first volume of poetry was published in 1889. The poems were openly influences by the new overtly lesbian translation of Sappho, a Greek lyric poet, born on the island of Lesbos, and the sensual lesbian imagery concerning young women and girls became a central theme in their neo-pagan poetry. Bradley and Cooper also wrote plays, and kept an extensive journal in which is mentioned that they were indeed lovers. In 1906 they converted to Roman Catholicism and their work began to reflect their new religious world-view. These newfound religious beliefs, combined with a social atmosphere becoming less and less tolerant seemed to stifle the sensuality of their earlier poetry. Cooper died in 1913, of cancer. Bradley spent the next eight months compiling their poetry into several new books, before dying of cancer herself.